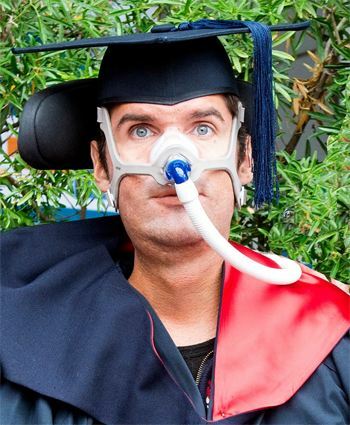 Muscular Dystrophy Australia would like to congratulate Ryan Struk on recently completing his Bachelor of Arts with distinction (majoring in International Relations and Middle Eastern Studies) at Deakin University. Ryan has been a diligent student and dedicated himself to his studies, with all of his hard work paying off on Thursday 16 April when he attended his graduation ceremony. MDA is very proud of Ryan for his excellent commitment to achieving this goal and we wish him all the best in this next chapter in continuing his education. MDA: What is the significance to you of completing a bachelor of arts? Ryan: Completing a BA allows me to utilise the research and writing skills I have acquired, to better articulate and explain ideas which are important to me. The opening speech at Deakin’s graduation ceremony was delivered by former Disability Discrimination Commissioner, Graeme Innes. Innes is a Lawyer and human rights campaigner who also happens to be blind. In the speech he stated that he is most interested in improving negative attitudes towards disability. These include the tendency of the mainstream media to portray people with disabilities as either heroes, objects of inspiration or ‘sufferers’.I related to the speech, as I’m similarly interested in improving attitudes; there needs to be more focus on improving services such as independent living and combating systemic discrimination against disability by employers, to name just two. I believe there is also a lack of coverage in the mainstream media about disability related issues. I feel that upon completing this degree, I will be better equipped to contribute towards improving these things. MDA: Did you find it difficult to manage the workloads and writing involved in completing a degree? Ryan: I think Muscular Dystrophy does place limitations on study, in terms of ability to attend on campus study and physically writing essays. There are however, options for off-campus, part time study as well as voice recognition software. Fortunately, arts and humanities is available in off- campus mode unlike many disciplines. I was able to complete the entire degree from home, conduct research via the library website and access books, journals and course materials in electronic format. Voice recognition software also allowed me to write fairly efficiently. I did some on-campus study a number of years ago, which was difficult to manage in terms of support hours, travel and accessing materials in hard copy. – From all of the team at MDA, well done Ryan.